The Cleary-Dickert House is in the Historic Saint John's Quarter. 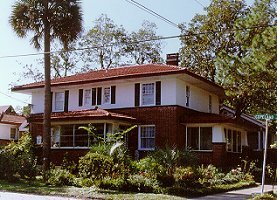 A 1914 Prairie style home established in 1994, it is located 50 yards from the Saint John's River in the historic Riverside district. The garden in front of the house combines elements of a Southern and an English cottage garden. Behind the house the brick courtyard is bordered by colorful flower beds, and dotted with flower-filled urns by the splashing fountains. Each suite,one award winning, consis is of a separate sitting room, bedroom and private bath. They invite you to relax, have a "spot of tea," enjoy the warm and inviting atmosphere and smell the fresh-cut flowers. An authentic English pot of tea is brewed and served, as are hors d'oeuvres and wine in the evening. A delicious and substantial breakfast, including home made breads, is served each morning in the formal dining room. Major credit cards accepted. This and other Jacksonville Bed and Breakfast Inns can be found here in The Register. Romantic Country Inns, Getaways and B&Bs offer a great Florida lodging alternative to big hotels.